A picture taken for a non-vinyl related project (see the Cabinet of Curiosities page) but which I thought it would be worth adding a posting about it as well. 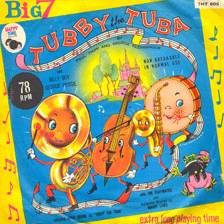 These groovy 7″ EPs were the first records I ever remember seeing or our family owning. We had a small record player at home, and my mother came back one day with a couple of titles. One of these was (believe it or not) the multiplication times tables – set to music! We had to listen to this to try and improve our maths. It didn’t work in my case (I failed Maths O Level the first time and had to retake a year later). So perhaps I can blame lack of effort at school on records after all? The big USP of these particular records was that they had brightly coloured sleeves, and the records themselves were almost always pressed in coloured wax of one sort or another. Sometimes a solid colour, but often multi-coloured or flecked plastic. These might be opaque or transparent. A lot of the older labels issued Children’s titles, but these were usually in fairly sober sleeves and often based on the books which the readings came from. The newcomer on the block was Happy Time Records, which turns out to be our old friends Pickwick International. The material was recorded in America (where they also issued full length albums, with the snappy catch line ‘hi-fi for small fry’! 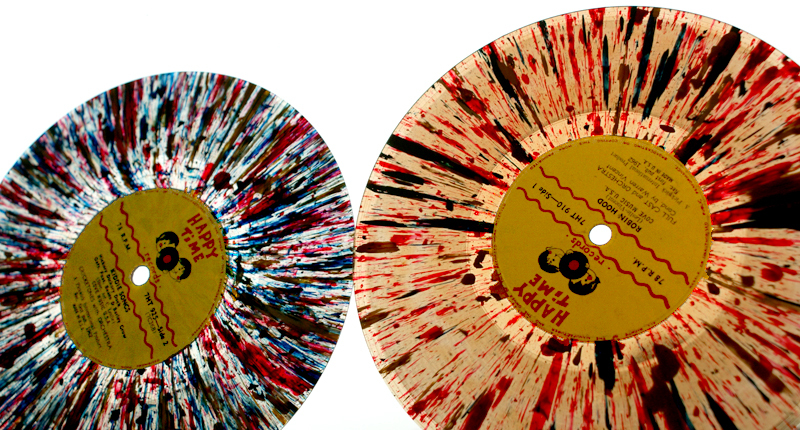 One of the US labels is shown here – the UK 7′ labels were yellow, red and black on white), and then reissued over here in England. It may have been a short lived project, most UK issues carry the date 1962 on. 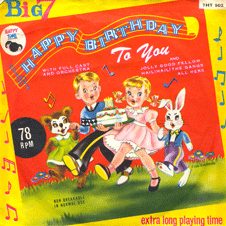 It wasn’t unusual for labels like Pickwick to blitz the market with a large launch catalogue. 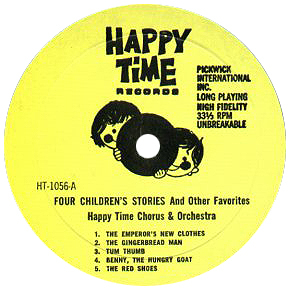 Some of the records are credited to the Happy Time Chorus or the Happy Time Chorus and Orchestra. Others are given over to more specific names, so I Wanna Be A Lifeguard (I can imagine my mum going bananas at that spelling in 1962!) is sung by Captain Paul & The Seafaring Band. Cover wise they do reflect a particular American trait for garish children’s illustration, but this isn’t without a certain kitsch appeal today. The records still turn up in charity stores from time to time, and when cheap I can’t resist them just to prop in the window and let the light shine through. Most are too scratched to play even if I did have a 78 rpm deck. Thanks to minigroove.nl for the two sleeves. This entry was posted in coloured vinyl. Bookmark the permalink. Wow! Do I remember these records… some played at 78 rpm. I think. Yes, speeds varied but some were 78 rpm. One firm also marketed a dedicated record player to go with them which I sometimes see at antique fairs, but never at a price / condition ratio which works for me!